Exciting news! Novels written by Judith Marshall and Margaret Davis have ingredients for the big screen–quirky characters, unusual circumstances, satisfying endings. Sociologist Margaret Davis (author of Straight Down the Middle) offers a fresh take on the battle of the sexes. “The battle of the sexes is over,” according to Maria Shriver in a Forbes Woman article (by Heidi Brown, October 16, 2009). But does anyone really believe that? Davis tackles the subject in a different way. 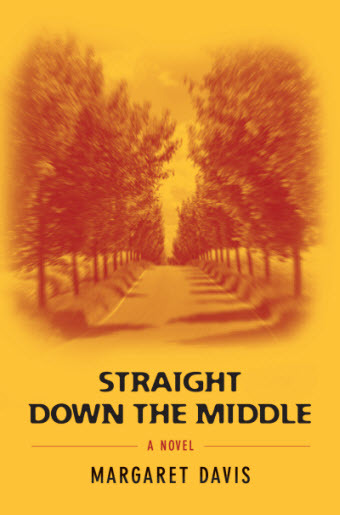 Straight Down the Middle tells the tale of Diane who finds herself unwillingly pitched into such a battle. Diane wants to have a baby, her long-time lover Cindy agrees, and they ask a neighbor Sam to father the child. But after the baby boy is born, Diane finds herself in the middle of a heated tug-of-war between a strong-willed Sam who wants to maintain contact with his son, and an equally strong-willed Cindy, who wants him gone. Diane’s attempts to keep the peace lead to lies, intrigues and cover-ups galore—until finally, she is forced by circumstances to “get out of the middle” and search out her own needs and desires. The book is “A fresh take on the battle of the sexes. A smart, modern comedy with a deep heart,” says Author and Screenwriter Frank Baldwin. Glamour Gal Judith Marshall (author of Husbands May Come and Go but Friends are Forever) celebrates fresh hopes, second chances, and the anything-but-simple art of relationships. Husbands May Come and Go but Friends are Forever is set in a small town in Northern California, in the spring of 2000 when the dot-com boom was at its peak. The story centers around Elizabeth Reilly-Hayden, a successful executive in her late fifties and a divorced mother of two. Emotionally armored and living alone, she wants only to maintain the status quo: her long-term significant other, her job and her trusted friends— five feisty women who first met in high school. Yet in a matter of days, the three anchors that have kept her moored are ripped away. 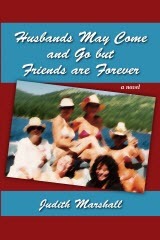 The group of lifelong pals gathers at Lake Tahoe to attend to the funeral arrangements of their beloved friend, and tries to unravel the mystery of her death. Through their shared tragedy, Liz learns how disappointment and grief can bloom into healing and hope. “Judith Marshall has written a book that, once you start it, you will not want to put down, and once you finish it, you will want to read again. It makes you remember that there is nothing quite so important as good friends.”—D.W. Buffa, author of Breach of Trust and many other legal thrillers. I’m thrilled for the two of you. When your novels become Hollywood movies, I won’t wait for the release of DVDs; I will go to the cineplexes.